WASHINGTON, D.C. -- Americans who have been out of work for a year or more are much more likely to be obese than those unemployed for a shorter time. The obesity rate rises from 22.8% among those unemployed for two weeks or less to 32.7% among those unemployed for 52 weeks or more. 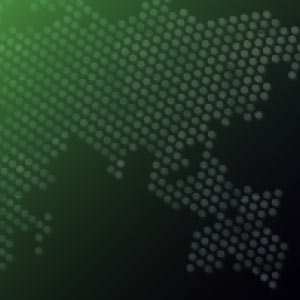 Gallup tracks U.S. obesity levels daily using Americans' self-reported height and weight to calculate body mass index (BMI) scores as part of the Gallup-Healthways Well-Being Index. Individuals with BMI scores of 30 or higher are considered obese. The Gallup-Healthways Well-Being Index also tracks the percentages of Americans who report that they have ever been diagnosed with various health conditions related to obesity, including high blood pressure, high cholesterol, and diabetes. 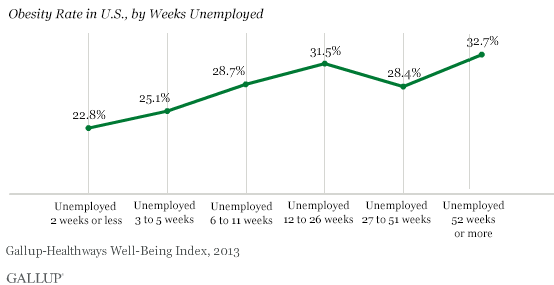 These results are based on nearly 5,000 interviews throughout 2013 with the long-term unemployed (defined by the Bureau of Labor Statistics as being unemployed for 27 weeks or more) and more than 13,000 interviews with the short-term unemployed (those out of work for less than 27 weeks). Gallup and Healthways also track the percentages of Americans who say they currently have or are being treated for health conditions such as high blood pressure and high cholesterol. 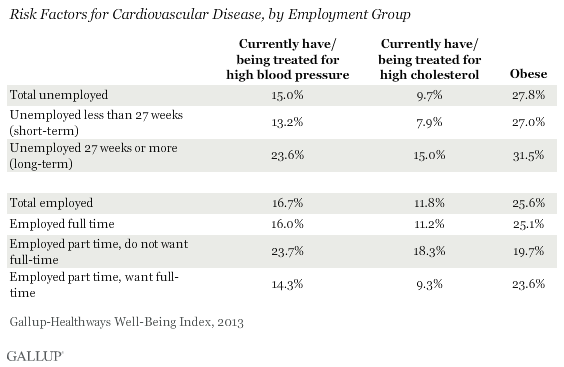 In both cases, the differences between the short-term unemployed and the long-term unemployed are striking: Those who have been jobless for 27 weeks or more are nearly twice as likely to say they currently have high blood pressure, and to say they have high cholesterol. Notably, Americans who have been unemployed for less than 27 weeks are somewhat less likely than those with jobs to have each of these conditions -- but this is because they tend to be younger than those who have jobs (33.6 years vs. 42.6, on average). While these results offer evidence of a strong relationship between unemployment and obesity-related health concerns, the causal direction is not clear. Unemployment may cause some people to engage in behaviors that lead to health problems, while pre-existing health conditions may make it harder for others to find and keep work. For many individuals, both dynamics may be at work, perpetuating a negative cycle of declining job prospects and worsening health. Jobless Americans may be more likely to fall into such a cycle if a higher incidence of health problems hinders their efforts to find a good job. Those out of work for 27 weeks or more report experiencing an average of 4.7 days out of the past 30 when poor health kept them from doing their usual activities. That compares with an average of 2.8 lower-productivity days for those unemployed for a shorter period, and just 1.4 days for full-time workers. Over the longer term, one of the most worrisome implications of these relationships is that many of those who have been unemployed for a prolonged period may suffer chronic health problems even if they successfully re-enter the workforce. A 2009 study of Pennsylvania workers laid off in the 1970s and 1980s found that even 20 years later, these workers were 10% to 15% more likely to die in a given year than those who had not suffered a job loss. With record-setting rates of long-term unemployment in most U.S. states, the health consequences of extended periods of joblessness have become a rising concern for policymakers. 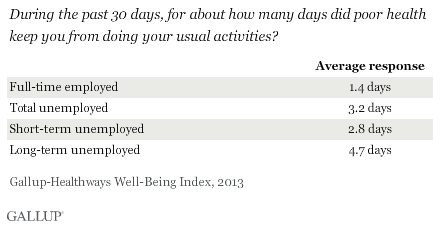 The Gallup-Healthways Well-Being Index makes it possible to examine health and well-being conditions associated with long-term unemployment more closely than is possible using smaller-scale studies. Importantly, the tracking data can be aggregated to produce the large sample sizes necessary for studying well-being among specific employment groups. One key concern raised by the current analysis is that employers in industries that require manual labor, such as manufacturing and construction, may be less likely to hire candidates who are clearly out of shape. If so, workers in these industries -- who already earn lower wages, on average, than those in knowledge-based sectors -- may be even more likely to be caught in a negative cycle of joblessness and poor health. More broadly, private employers' high healthcare costs might lead them to avoid taking chances on those who pose greater health risks, particularly in a tenuous economic climate. As a result, candidates who are obese and who have been unemployed for 27 weeks or more may have two strikes against them even before they sit down for an interview. Results for this Gallup poll are based on telephone interviews conducted Jan. 1-Dec. 31, 2013, on the Gallup Daily tracking survey, with a random sample of 356,599 adults, aged 18 and older, living in all 50 U.S. states and the District of Columbia. For results based on the total sample of national adults, the margin of sampling error is less than ±1 percentage point at the 95% confidence level. The total number of unemployed respondents is 18,322, with 13,352 unemployed for less than 27 weeks (short-term) and 4,970 unemployed for 27 weeks or more (long-term). Over half of Americans (55%) report that they are neither overweight nor trying to lose weight, while 18% say they are overweight and trying to lose weight. Another 18% say they are overweight yet are not trying to lose weight. Americans who have been unemployed for long periods of time are more likely to suffer from depression than those who have been unemployed for shorter periods.